Pink (H8) flowers, VII–X, sparse; mid-green foliage, young shoots tipped brilliant yellow in spring; open spreading habit; height 21–25cm; spread 31–45cm. Found at Cow-y-Jack near Coverack on the Lizard Peninsula, Cornwall by Andrew Byfield, 18 August 1984; propagated and introduced by Denbeigh Heather Nurseries. By far the best clone of Williams's heath for coloured spring shoots. Named after the place in Cornwall where it was found. Pink flowers, VII–X; mid-green foliage, young shoots with yellow tips in spring; height 21–25cm; spread 31–45cm. Found near Croft Pascoe Pool, The Lizard, Cornwall, in 1981 Mrs Cherry Turpin. Shell-pink (H16) flowers, VII–X; mid-green foliage, young growth yellow; height 26–30cm; spread 46–60cm. Similar to, but more upright than 'Gwavas'. Found by David Coombe in the Lizard National Nature Reserve near Penhale, Cornwall. Pink (H8) to shell-pink (H16) flowers, VII–XI, the stamens malformed and contorted; mid-green foliage; broad upright habit; height 21–25cm; spread 31–45cm. Wild-collected; found at Gew-graze on The Lizard, Cornwall, England, by Mrs Jean Paton, Mrs Barbara Garratt and Mrs J. Yorston on 8 September 1974; propagated and introduced by 1988. Lilac flowers (H4), VIII–IX; golden yellow foliage; very compact and slow-growing; height less then 10cm; spread 10–15cm. Selected from the progeny of a deliberate cross between Erica tetralix 'Alba Mollis' and Erica vagans 'Valerie Proudley' by Professor John Griffiths (Garforth, Yorkshire). Shell-pink (H16) flowers, VII–XI; mid-grey-green foliage, new shoots yellow; height 16–20cm; spread 31–45cm. Found by Miss Waterer on Goonhilly Downs, Cornwall, when staying at Gwavas Farm, near Cadgwith. Pink (H8) flowers; VII–XI; foliage mid-green, young shoots yellow and this colour persists well into summer; habit neat semi–prostrate; height 10–15cm; spread 31–45cm. Found by Jean Julian (Mrs Jean Preston) at Kynance Cove, Cornwall, in 1999. 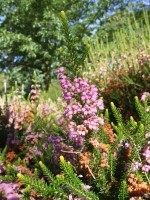 Named after the finder, Honorary Secretary of The Heather Society at that time. Registered on 1 November 2001 by David Small. Clear magenta (H14) flowers aging to shell-pink (H16), VII–XI; mid-green foliage even on young shoots; compact spreading habit; height 26–30cm; spread 46–60cm. Selected from the progeny of a deliberate cross between Erica tetralix 'Hookstone Pink' and Erica vagans 'Mrs D. F. Maxwell' made at Sardis, British Columbia, Canada, by David Wilson by 1992. It is named after the raiser's father. Pale pink flowers, VIII–X; grey-green foliage; compact spreading habit; height 31–45cm; spread 46–60cm. Wild-collected (plant 6); found above Kynance Cove on The Lizard, Cornwall, England, by Dr Alan Leslie and R. Bradshaw on 20 August 1975; introduced by 1993 through Cambridge University Botanic Gardens. Named after the place where it was discovered. Pale pink flowers, VIII–XI; mid-green foliage, young shoots tipped yellow during spring; broad upright habit; height 21–25cm; spread 31–45cm. Wild-collected; found south of Leech Pool on the Lizard, Cornwall, England, by Miss Marion Hughes on 30 October 1983; introduced through Cambridge University Botanic Gardens by 1993. Lilac-pink (H11) flowers, VII–XI; mid-green foliage, young shoots tipped yellow during spring; height 21–25cm; spread 31–45cm. Dwarf and much-branched ... with masses of small flowers of a pleasing pink produced up the stem - much as they are in Erica vagans - and occasional tufts of flowers lower on the stem. Wild-collected (plant 2); found north-west of Trelan on The Lizard, Cornwall, England, by P. D. Williams (Lanarth) before 1910 (cf Turrill 1922). 'He told me he actually found the plant nestling against his garden wall'. Found on the same day as Erica vagans 'St Keverne'. Flowers single,corolla white; VII-IX; calyx lobes green, unequal, fused only at base; 4-lobed; lobes with very sparse hairs in bud; stamens 8, short; filaments ±2mm long, free or variously and irregularly fused in groups of 2-3; anthers small, thecae pale red when young turning pale tan; foliage light green; young shoots yellow; habit low-growing; height ±15cm: spread 30cm after 4 years. Deliberately bred seedling raised in 1986 from crosses made the year before; Erica tetralix 'Alba Mollis' x Erica vagans 'Lyonesse'. ® E.2007:09 registered on 12 June 2007 by David Wilson, Chilliwack, British Columbia, Canada.